The berries from our local Saskatoon Berry farm are out of this world. While they do grow wild around here the farmed ones are much more tender and juicy than the wild. If you’re a Saskatoon Berry fan as I am, you may be on the lookout for different ways to serve these instead of simply baking them in a pie. While I have several other Saskatoon berry recipes on this blog, here’s a new one. I picked up this cookie recipe last time I was at the farm, and changed it a little to make it more interesting. Using an electric mixer, combine butter, sugars, egg, milk and almond extract until light and fluffy. Whisk together the flour, cinnamon, baking soda, and salt and add to the butter mixture. Add the rolled oats and coconut, mix thoroughly and then very gently stir in the Saskatoon berries. Be careful not to break them. You don’t want purple cookie dough! Place the dough in the fridge for 1 hour, then drop by spoonfuls on to parchment paper lined cookie sheet. Bake at 350 degrees for 12 – 14 minutes. 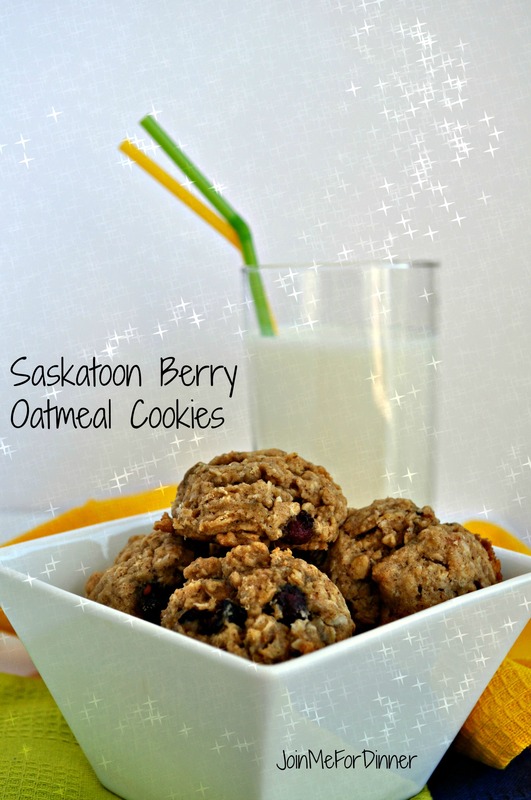 This entry was posted in cookies, desserts and tagged berry cookies, cobble hill saskatoon berry farm, oatmeal cookies with berries, saskatoon berry cookies, saskatoon berry dessert recipes, saskatoon berry oatmeal cookies, saskatoon berry recipes. Bookmark the permalink. How much baking soda. ? Fantastic looking recipe. 1 teaspoon. I’ve fixed the recipe. Thanks so much for pointing that out! Hope you like them. Using them slightly thawed is a great way to prevent purple cookies! Great idea. Glad you like them. Just think of all those antioxidants and other nutrients you’re getting from those healthy little berries!